The future of tiny home design is looking very bright. A team of students from Sacramento State, working under the name Sol Vespiade, have designed a beautiful self-sustaining tiny home that reflects a new sustainable way of living for future generations. 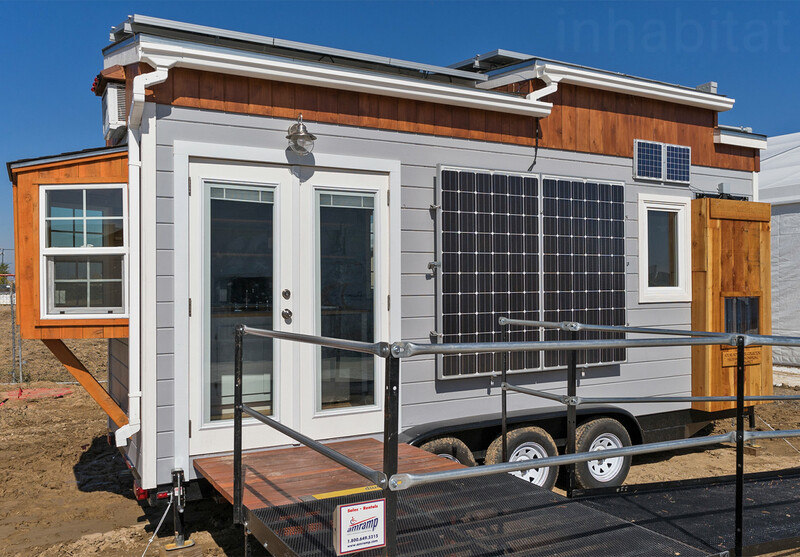 The solar-powered, 400-square-foot home on wheels – with a seriously comfy interior – is a powerhouse of energy generation that offers the ultimate in flexible, off-grid living. The exterior of the tiny home was clad in a light paint color with cedar trim, paying homage to the traditional American wooden homes. However, this classic look has been modernized with various innovative and visible sustainable features that take the home into the future of sustainable living. A vertical wall of solar panels was installed on the northern facade, complementing the roof’s solar array, in order to provide the home with ample electricity. Alternatively, the home’s southern facade is equipped with an evacuated tube solar collector, which converts sunlight into heat for water. The system is protected by a rigid steel frame that keeps it safe while traveling. For the home’s water needs, a 40 gallon rainwater collection tank was affixed to the home’s western side. The home’s entrance is through two wide french doors that swing out as to not take up too much space once inside the home. The living space is light and airy thanks to the glass doors as well as a large bay window that sits over an extended counter/dining space. In addition to the natural light they offer, the multiple windows provide cross ventilation to create a healthy, natural atmosphere, reducing the need for air conditioning. 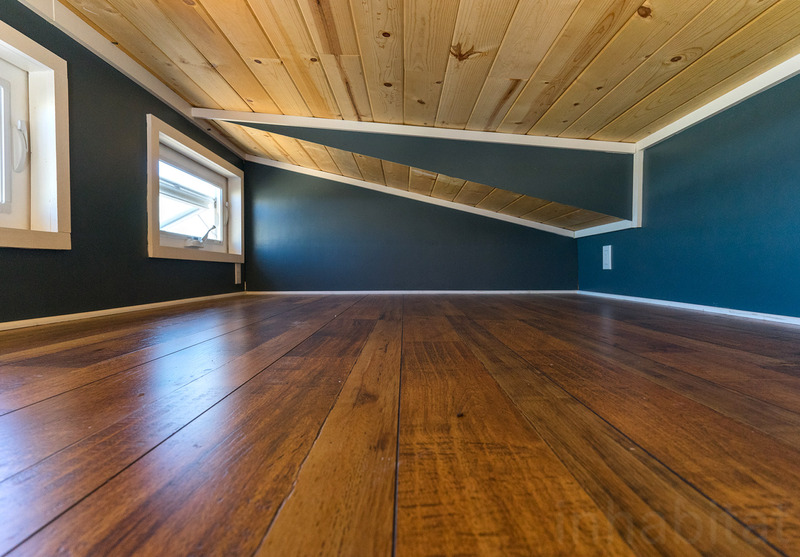 The interior design is a sophisticated blend of a cool teal color on the walls, accented with honey-toned wood paneling. The wooden accents are used in the home’s shelving, flooring, and the stairs, which lead up to a small sleeping loft. Hidden in a corner is a mechanical well that allows for monitoring of the home’s electrical and water use. Eight 6 watt deep-cycle batteries that store the energy and a 20 gallon water tank stores the water heated by the solar collector. 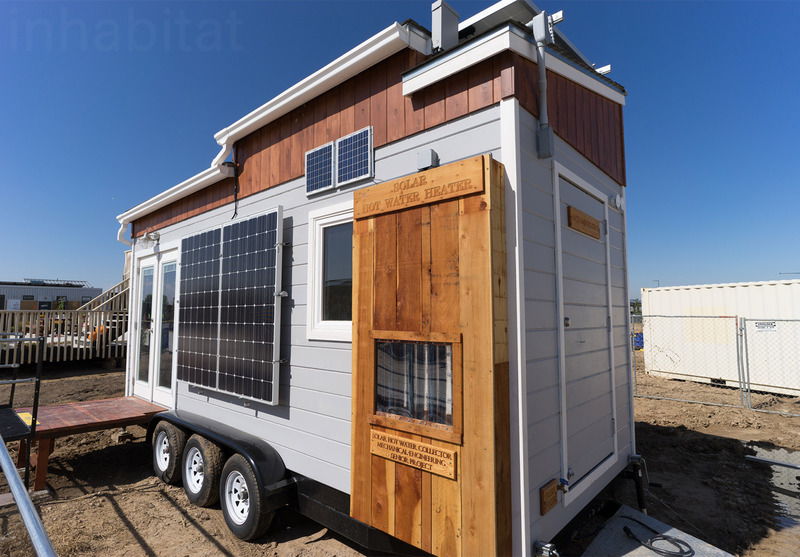 The tiny home will soon be on display in Sacramento’s upcoming SMUD Tiny House Competition. The future of tiny home design is looking very bright. A team of students from Sacramento State, working under the name Sol Vespiade, have designed a beautiful self-sustaining tiny home designed to represent a new sustainable way of living. 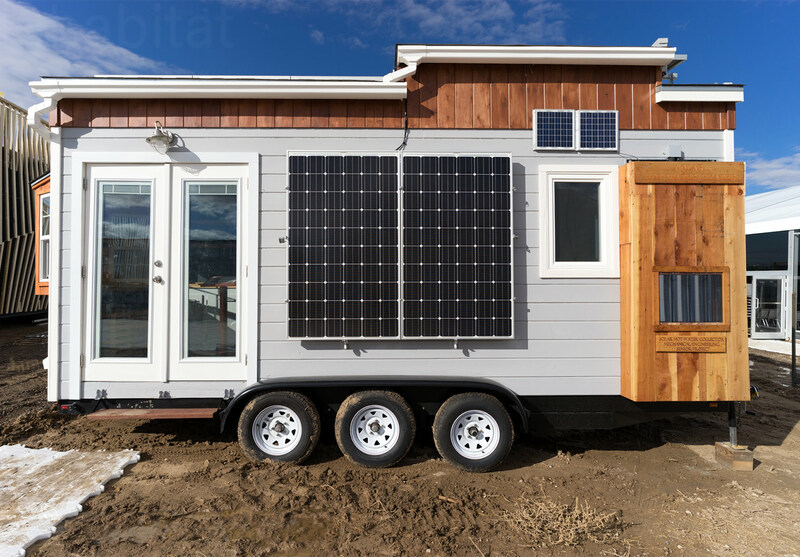 The solar-powered, 400-square-foot home on wheels - with a seriously comfy interior - is a powerhouse of energy generation that offers the ultimate in flexible, off grid living. The exterior of the tiny home was clad in a light paint color with cedar trim, paying homage to the traditional American wooden homes. The tiny home has been modernized with various innovative and visible sustainable features that take the home into the future. A vertical wall of solar panels was installed on the northern facade, complementing the roof's solar array, in order to provide the home with ample electricity. 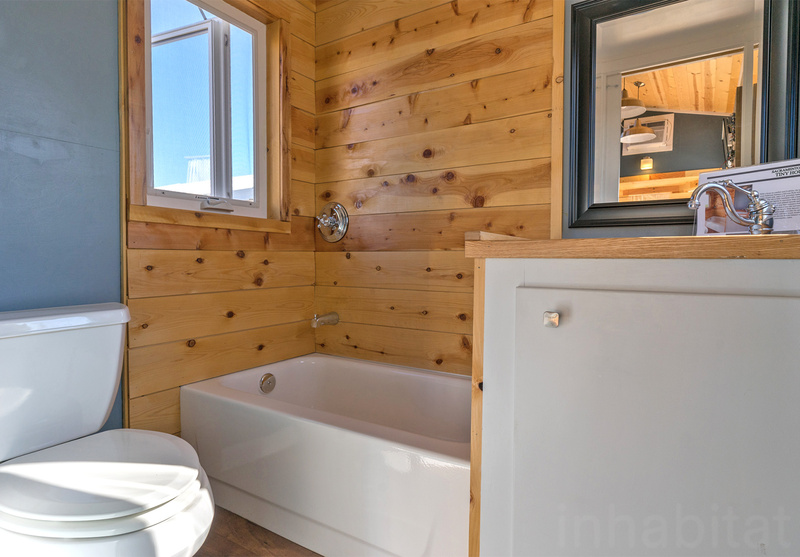 The tiny home's interior is compact, but welcoming. A sleeping loft is on the top floor. 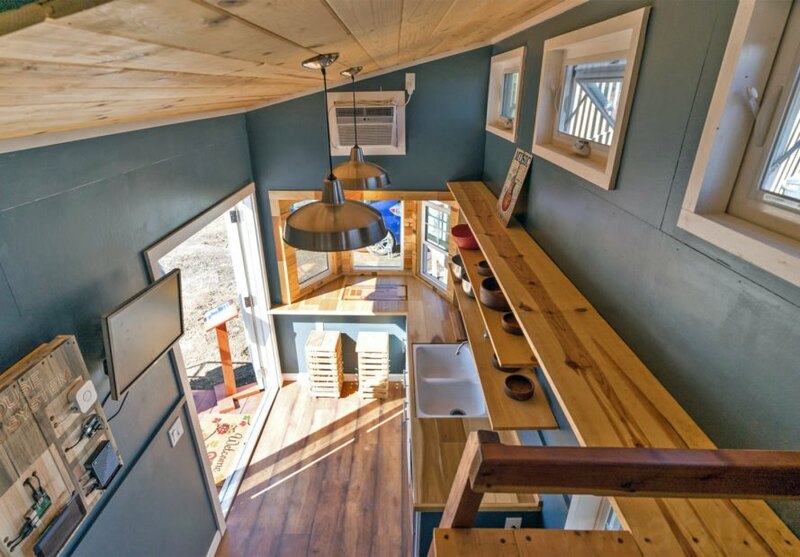 The tiny home has all of the comforts of a contemporary home. The home's entrance is through two wide french doors that swing out as to not take up too much space once inside the home. The living space is light and airy thanks to the glass doors as well as a large bay window that sits over an extended counter/dining space. The classic look has been modernized with various innovative and visible sustainable features that take the home into the future of sustainable living. A vertical wall of solar panels was installed on the northern facade, complementing the roof's solar array, in order to provide the home with ample electricity. Alternatively, the home's southern facade is equipped with an evacuated tube solar collector, which converts sunlight into heat for water. The system is protected by a rigid steel frame that keeps it safe while traveling. For the home's water needs, a 40 gallon rainwater collection tank was affixed to the home's western side. Related: Luxury Fireside tiny house resort carries an important message for sustainability The home's entrance is through two wide french doors that swing out as to not take up too much space once inside the home. The living space is light and airy thanks to the glass doors as well as a large bay window that sits over an extended counter/dining space. In addition to the natural light they offer, the multiple windows provide cross ventilation to create a healthy, natural atmosphere, reducing the need for air conditioning. The interior design is a sophisticated blend of a cool dark teal color on the walls, accented with honey-toned wood paneling. The wooden accents are used in the home's shelving, flooring, and the stairs, which lead up to a small sleeping loft. Hidden in a corner is a mechanical well that allows for monitoring of the home's electrical and water use. Eight 6 watt deep-cycle batteries that store the energy and a 20 gallon water tank stores the water heated by the solar collector. 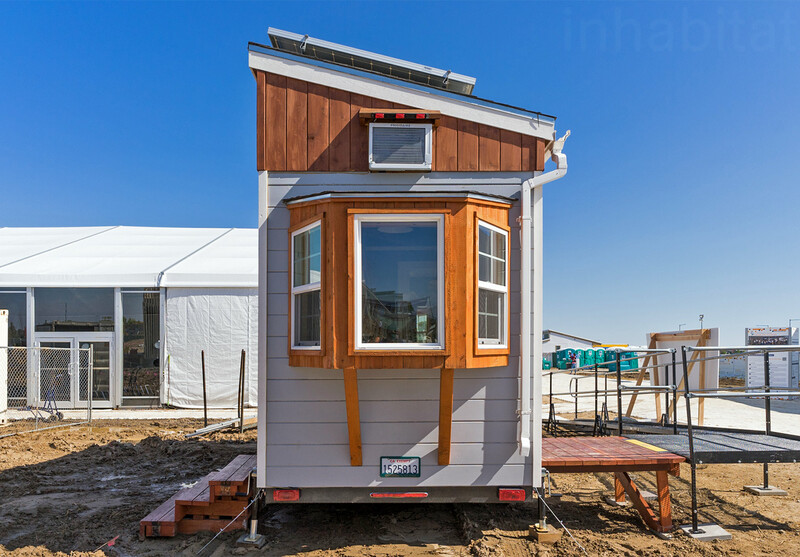 The tiny home will soon be on display in Sacramento's upcoming SMUD Tiny House Competition. The interior design is a sophisticated blend of a cool dark teal color on the walls, accented with honey-toned wood paneling. 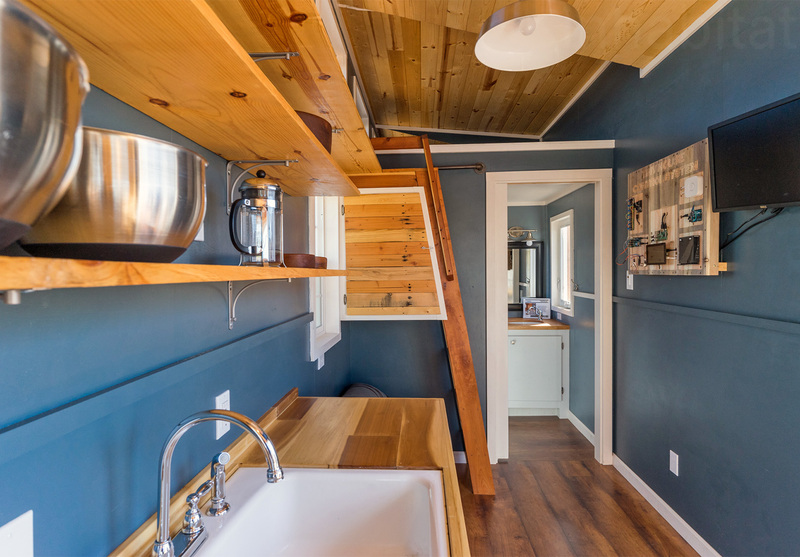 The home was built for the SMUD tiny home competition in Sacramento. For the home's water needs, a 40 gallon rainwater collection tank was affixed to the home's western side. The wooden accents are used in the home's shelving, flooring, and the stairs, which lead up to a small sleeping loft. Hidden in a corner is a mechanical well that allows for monitoring of the home's electrical and water use. 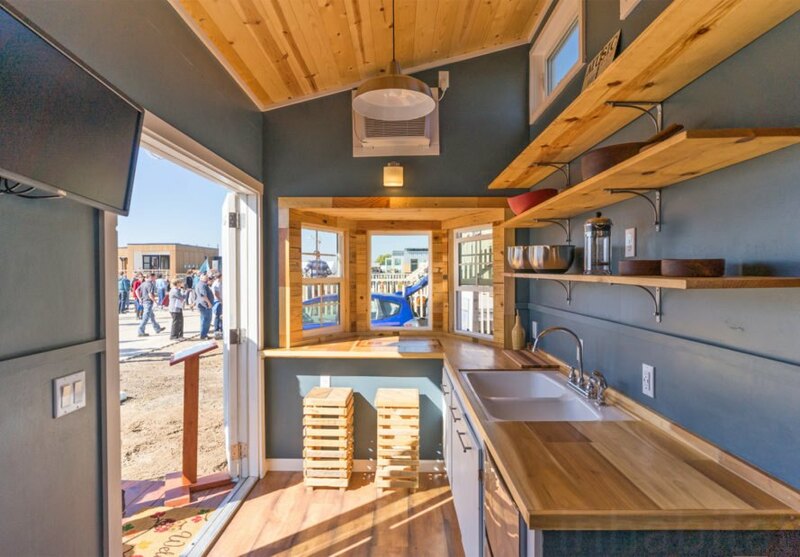 The tiny home will soon be on display in Sacramento's upcoming SMUD Tiny House Competition.